The image that surrounds pizza is that of it being a fun food, probably nothing to do with fine meals. Then again, any number of folks uses pizza as part of their dinner, regular food diet and even on special occasions. Pizza on its own is a great tasting, full of nutrients and healthy food. If you have had pizza before, and we are sure you have, you would have probably enjoyed it with beverages such as cola. If you thought cola makes the pizza better, then wine makes it even better. A beverage is supposed to compliment the main course. Even though all pizzas are supposed to fall under the same category of food items, every pizza is different based on the topping that is decorating it. Pizza is also distinct based on the sauce that is used to prepare it. Then, you have side dishes like pasta, barbeque chicken and of course, garlic bread, our personal favourite. When you are picking wine for the night’s pizza dinner, it is a good idea to plan ahead. Either you pick the wine and then decide the pizza you are going to order, so that the wine and pizza match each other. Or, you decide the type of pizza, toppings and side dishes that you are going to purchase ahead of time and then, decide on the wine. The standard rules associated with picking up wine might just be useful to you. For instance, take pizzas that use extensive use of tomato sauce. Tomato sauce is used in a wide range of pizzas. It turns out, tomato is very high on acids and that interferes with the choice of the wine you are going to make. You will need a wine that is extremely light on acidity because you are already getting it in your pizza. Like this, if the topping is Pepperoni, you need to remember that it is usually hot and also salty. You have to purchase wines that work well with salty food. 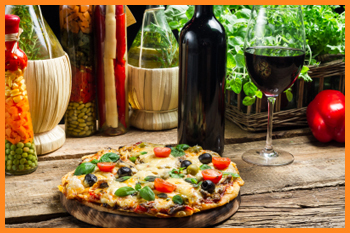 Easily, red wines are the best wines to go with pizza. The standard tips in choosing the right wine will help you in your wine search. Then again, there are some standard wines that just do well with pizzas, most of them sourced from Sauvignon and Zinfandel. These are all different types of grapes from which many several types of wines are made. Syrah is probably the most popular red wine ever. The unique feature of this wine is that it is spicy. If you like your pizza on the lighter side of the spice spectrum, then you will have to pick up a few bottles of Syrah. Another name for Syrah is Shiraz, a name it derives from its origins from the valley of Rhone in France. This wine also has hints of pepper which is mixed with meat that has been roasted to get a unique burnt flavour. Syrah is a wine that is served best with food that is heavy on meat. Going by the same understanding, it is clear that you will be served best by Syrah wine if the pizza you are ordering is non-vegetarian. The same pizza will work just fine, if you are ordering vegetarian based pizzas as well, as long as you order something that has roasted toppings, perhaps mushroom and tomatoes. If you are not a big fan of the spicy flavour of the Syrah variety of wines, then you are going to love Cabernet Sauvignon. Compared to Syrah, Cabernet Sauvignon is more on the softer side of wine flavour. It is also one of those wines which actually taste better when they are young, rather than when they are old. Another phenomenon that is noticed with this wine is that it will usually have traces of vanilla, which you would enjoy to go with your pizza. The source of this wine is the valleys of Chile and California. Hopefully the wine suggestions that are provided here will help you with your next pizza event. You are spending so much time looking for the right wine; you should also spend the same amount of time finding the best pizza place in town. Pick a restaurant which has easy online ordering options and a great parking facility. The author usually chooses to have Syrah with his pizza. Of course, he always chooses to go with pizza online delivery for added convenience.